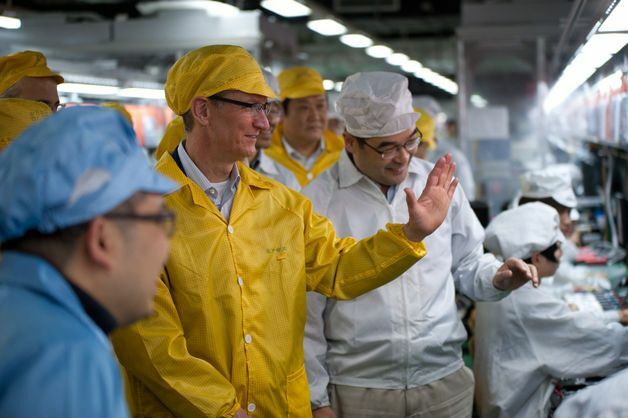 Tim Cook spent time with Foxconn employees during his visit to China earlier this year. The New York Times raised quite a stink at the beginning of this year with its provocative ‘iEconomy’ series on the poor working conditions at Foxconn, Apple’s largest manufacturing partner in China. After running headlines like “In China, human costs are built into an iPad,” the Times has published a new report that more positively portrays Apple’s recent efforts to improve working conditions in the supply chain. After the mainstream media turned its attention to Apple and Foxconn, the Fair Labor Association (FLA) got involved to help ensure quality factory life for Chinese workers. For years, Apple has also been performing detailed audits of over 800 facilities where parts for its products are made and assembled. The Cupertino company has been beefing up its requirements in order to set the bar even higher in the supply chain. All of the combined efforts have resulted in better overall working conditions and pay raises for Foxconn employees. But that doesn’t mean there’s no more progress to be made. Foxconn was still failing to stop illegal overtime, the association’s lead inspector told Mr. Gou and his lieutenants, according to multiple people with knowledge of the meeting. The company was failing to keep student interns off night shifts. Foxconn had not put sufficient safety policies into practice and had exposed potentially hundreds of thousands of workers to at least 43 violations of Chinese laws and regulations. Since then, Foxconn workers like Pu Xiaolan have seen the factory make noticeable improvements to the way employees are treated. Small things like nicer chairs have been given to workers that sit on the assembly line all day. Hours are less demanding. Pay has gone up. There seems to be a new sense of morale within the walls of Foxconn. After the meeting with the Fair Labor Association, Foxconn announced that by July 2013, no employee would be allowed to work more than an average of 49 hours a week — the limit set by Chinese law. Previously, some Foxconn employees worked schedules that approached 100 hours a week. No other major manufacturer has pledged to abide by China’s work-hour laws in such a public manner. Foxconn, which is based in Taiwan, also promised to increase wages, so employees’ total pay would not decline despite fewer hours — the equivalent of a 50 percent raise for many workers, analysts say. Make sure to read the full report for more details, including how these recent developments have pushed companies like HP to also improve conditions overseas. The Times is mostly positive, but the report does indicate that Apple needs to push for even more reform and show even greater transparency. If any company has the power to change things in this arena, it’s definitely Apple. CEO Tim Cook recently announced that part of the Mac lineup (probably the Mac mini) would start being manufactured in the U.S. come 2013. Foxconn has also said that it’s expanding its presence in the U.S. with new factories. The Times has also called out Apple’s tax evasion practices, retail employee pay rates, and weaponizing of patents.